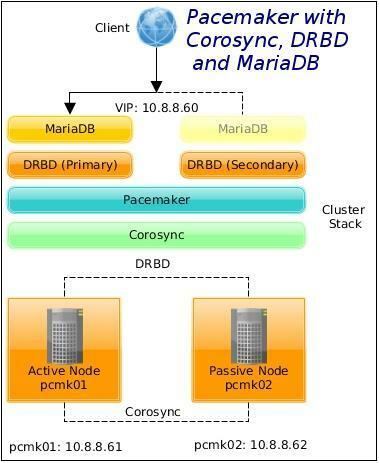 We are going to build a two-node active/passive MariaDB HA cluster using Pacemaker and Corosync. We will use MariaDB, which is a binary drop in replacement for MySQL. MySQL is no longer in CentOS’s repositories and MariaDB has become the default database system offered. MariaDB claims to have a lot of new options, extension, storage engines and bug fixes that are not in MySQL. Check this page https://mariadb.com/kb/en/mariadb/mariadb-vs-mysql-compatibility/ for more info about the MariaDB. No shared storage will be required. At any point in time, the MariaDB service will be active on one cluster node. The convention followed in the article is that [ALL] # denotes a command that needs to be run on all cluster nodes. We have two CentOS 7 virtual machines on VirtualBox, named pcmk01 and pcmk02. 172.16.22.0/24 – non-routable cluster heartbeat vlan for DRBD (internal network adapter). A simplified network configuration can be seen below. Network configuration for the first node can be seen below, it is the same for the second node except the IPs which are specified above. Authenticate as the hacluster user. Authorisation tokens are stored in the file /var/lib/pcsd/tokens. Generate and synchronise the Corosync configuration. DRBD refers to block devices designed as a building block to form high availability clusters. This is done by mirroring a whole block device via an assigned network. DRBD can be understood as network based RAID-1. Configure DRBD, use single-primary mode with replication protocol C.
We have a resource named mysql01 which uses /dev/vg_centos7/lv_drbd as the lower-level device, and is configured with internal meta data. The resource uses TCP port 7789 for its network connections, and binds to the IP addresses 172.16.22.11 and 172.16.22.12, respectively. If case we run into problems, we have to ensure that a TCP 7789 port is open on a firewall for the DRBD interface and that the resource name matches the file name. We need to give the same SELinux policy as the MariaDB datadir. The mysqld policy stores data with multiple different file context types under the /var/lib/mysql directory. If we want to store the data in a different directory, we can use the semanage command to add file context. [pcmk01]# semanage fcontext -a -t mysqld_db_t "/mnt(/.*)?" Please be advised that changes made with the chcon command do not survive a file system relabel, or the execution of the restorecon command. Always use semanage. Stop: mysql_VIP01 -> mysql_service01 -> mysql_fs01. Where mysql_fs01 is the filesystem resource, mysql_service01 is the mysqld service resource, and mysql_VIP01 is the floating virtual IP 10.8.8.60. Disable STONITH. Be advised that a node level fencing configuration depends heavily on environment. You can check this page for Pacemaker STONITH device configuration on VMware. notify: when stopping or starting a copy of the clone, tell all the other copies beforehand and when the action was successful. Create a cluster resource named mysql_fs01 for the filesystem. Tell the cluster that the clone resource MySQLClone01 must be run on the same node as the filesystem resource, and that the clone resource must be started before the filesystem resource. Create a cluster resource named mysql_service01 for the MariaDB service. Tell the cluster that the MariaDB service must be run on the same node as the mysql_fs01 filesystem resource, and that the filesystem resource must be started first. Finally, create a cluster resource named mysql_VIP01 for the virtual IP 10.8.8.60. IPaddr2 – manages virtual IPv4 addresses (Linux specific version). The virtual IP mysql_VIP01 resource must be run on the same node as the MariaDB resource, naturally, and must be started the last. This is to ensure that all other resources are already started before we can connect to the virtual IP. Host 'puppet.hl.local' is not allowed to connect to this MariaDB serverConnection closed by foreign host. This entry was posted in High Availability, Linux and tagged CentOS, Corosync, DRBD, LPIC-3, MariaDB, MySQL, Pacemaker. Bookmark the permalink. If you notice any errors, please contact us. Best article I’ve seen yet on this topic. Clear, concise and completely accurate. Thanks. I have to agree with this one, not that many constructive articles for CentOS 7 on the net. I had some troubles migrating Pacemaker from RHEL 6 to RHEL 7, therefore putting it online seemed like a good idea. Excelent post. I haven’t tried jet but doesn’t seems hard to follow. Why did you choose to replicate databases by files and not using mysql replication implementation? Do you know if is slower than syncing by the classic method? Thanks, and congratulations for the guide. Hi Felipe, Thanks for your feedback. I’m used to SAN based high availability solutions with active-passive management software and it was natural for me to use such approach for MySQL. I was migrating from cman (CentOS 6) to pcs (CentOS 7) in this particular case. Thanks for the article. Very nice!!! I get an error: ‘mysql01’ not defined in your config (for this host). Check the DRBD config, ensure you got the DRBD resource name right, also check hostnames of your DRBD nodes – they need to match with the ones defined in the config. i am currently working on a school project where im using PCS cluster. i managed to get it ip and running with my apache webservers. now im working on mariadb cluster. most of the config is the same and for the additional info i used your guide. the only thing that is different is that im using a MS iscsi target server for the shared directory. i managed to get it all up and running. both nodes have mariadb and the exact same. the parameters in the mysql_service resource are all specified to the shared storage location (/mnt/iscsi_share) exept the binary and config. i dident touch those. do you have any idea whear i need to start looking or what may couse this problem. the database on linux 5 works and i can reach it and modify it. What filesystem do you use on /mnt/iscsi_share? Is it mounted on all cluster nodes? What operating system do run the cluster on? Sorry for the late reply but my deadline is closing in and im very busy with the documentation. I managed to get it up and running correctly. im using ext.4 and run it on CentOS 7. The error had something to do with the constraints. I followed your guide on this. the db worked but was not able to shutdown. so i decided to remove them. Now the cluster worked like i said in the previous comment. Later i decided to give the constraints another try. I had one combining stonith device and filesystem. this one was giving me the problems. Now my cluster works with the following constraints. thanks for your help and your guide! i would not have managed to make ik without it! I’m glad you managed to sort it out. I see that you have a colocation constraint for the virtual_ip, but there is no ordering constraint for it. You should add one to ensure that all MySQL resources are started before you can connect to the virtual IP. Many thanks for your article. Currently, I am trying to deploy it through a two servers in VirtualBox. I have a question regarding the interfaces. For each IP address ( 10.8.8.61, 172.16.21.11 and 172.16.22.11 ), do you have a multiple interfaces in your servers or are they virtual interface? I would like to know which interface do you have to create it through vagrant. I do have multiple host-only interfaces for each IP address. When I create the interfaces ifcfg-enp0s8, ifcfg-enp0s9 and ifcfg-enp0s17 in a host-only interface of VirtualMachine it cannot auth. Besides, I only see eth interfaces as older mode. My apologies, the LAN is on a host-only adapter, but both non-routable cluster heartbeat vlans use internal network adapters. I’ve updated the article. What OS do you use? CentOS 7 uses so-called predictable network interface names by default, therefore the actual interface names on your system may be different compared to the ones mentioned in the article. If you want to go back to traditional interface naming scheme (“eth0”, “eth1” etc), you can do so in udev. I am also using CentOS 7. The issue that I have found that I was creating a VM with just one interface and when I created the enp interfaces communication between VMs wasn’t properly. So, auth step doesn’t work and I had to provision three interface for each network. After, I provisioned three interfaces and it create eth interfaces and communication between VMs was properly. Do you advice use the same network for the communication of pcmk nodes? You can use a single network interface for everything (LAN, Corosync and DRBD) if you wish, for testing it hardly matters. For production, you likely want to have redundant interfaces (teamed/bonded LAN, two Corosync rings etc). I really love this article! Hard to find good info on MySQL, everybody has Apache+DRBD, but this is the beezneez! I wanted to ask, if you have or could create an article for CentOS 6 as you mentioned that you used to use that. I am building HA VoIP Servers and currently all the pre-packaged distros are on CentOS 6 and I can only get HA working on CentOS 7 with pcsd lol, its been a nightmare figuring out if I want to build VoIP by hand on 7 or stuggle with HA on CentOS6 ontop of a custom Distro. After reading this, I am leaning towards building a custom server with PIAF/IncrediblePBX + Linux HA. Thanks! Glad you found it helpful. I’m afraid I have no plans to go back to CentOS 6. Not sure if it helps you, but cluster stack on CentOS 6 is based on cman, I may be wrong, but I think that crmsh is no longer available on RHEL (thus no longer available on CentOS), but pcs is fully supported starting CentOS 6.5. CentOS 6 has been around for quite some time now, I think that you’ll be able to find dozens of articles covering HA setup online. Just organizes the output of pcs in a nice OU. Was wondering if your interested/available for some paid support helping me get my system running, I am having some trouble, but I am going to create a new test bed this weekend and follow your guide to the letter and hope that works. is where I am at right now… I am literally just starting my career and got the go-ahead to build a HA Voip Server @ work and have been struggling getting MySQL Services moved over to DRBD/PaceMaker. Thanks for the great guide again! Not a mistake as such as I actually use a mysqld named folder under /var/run, however, I forgot to include a step for creating it. I updated the article, thanks for spotting. Just to make it clear, the folder that’s created by default is /var/run/mariadb/. With regards to resource groups, you’re right, grouping resources can simplify Pacemaker configuration, as in this article, but it’s not mandatory to get things working. You simply need to ensure that resources run on the same host by creating a colocation constraint with a score of INFINITY. Looking at the error you got above, it seems like your DRBD may not be configured properly. As for paid support, I’m usually open-minded, however, as a rule of thumb I only tend to provide support for systems that I build myself. Supporting something that was created by other people (however good or bad it might be) isn’t my cup of tea really as more often than not, such systems prove to be built in a haphazard way. Disclaimer alert – don’t take it for granted, it’s just my experience talking. I just wanted to say I got it! As a thank you I will make a donation! 4 others who may have the same issues I was. Good to know you finally managed to make it work. I have no errors with filesystem resource. Currently, I am using two vagrant machines to test it. Do you know wich kind of issue it could be? Because the status seems ok but pacemaker perform it like an error. What’s the value of drbd_resource that you passed to the Pacemaker when creating the cluster resource named mysql_data01? That looks good to me. What does pacemaker log say? Jun 27 14:30:06  pcmk01 cib: info: cib_perform_op:	++ <lrm_rsc_op id="mysql_data01_last_0" operation_key="mysql_data01_monitor_0" operation="monitor" crm-debug-origin="do_update_resource" crm_feature_set="3.0.10" transition-key="4:5:7:0e367aab-5184-4c54-87da-0562471c2635" transition-magic="0:6;4:5:7:0e367aab-5184-4c54-87da-0562471c2635" on_node="pcmk01-cr" call-id="5" rc-code="6" op-status="0" interval="0" last-run="1467037806"
Jun 27 14:30:06  pcmk01 cib: info: cib_perform_op:	++ <lrm_rsc_op id="mysql_data01_last_0" operation_key="mysql_data01_monitor_0" operation="monitor" crm-debug-origin="do_update_resource" crm_feature_set="3.0.10" transition-key="6:5:7:0e367aab-5184-4c54-87da-0562471c2635" transition-magic="0:6;6:5:7:0e367aab-5184-4c54-87da-0562471c2635" on_node="pcmk02-cr" call-id="5" rc-code="6" op-status="0" interval="0" last-run="1467037806"
Is there any reason you posted this 4 times? Ah, I see, not to worry. Due to huge amount of spam all comments are held for moderation. They only appear once manually approved. I’ll get rid of the duplicates. I’m afraid I’m unable to replicate this, it works fine for me. Do you have firewall and SELinux configured? That all looks good. You have some duplicate rules on iptables, but it’s not important. Try setting SELinux to permissive and stopping iptables, then do a resource cleanup and let me know if it makes a difference. I cannot spot any misconfiguration really. Finally, I doesn’t configure the network interfaces enp because I create it as eth with vagrant. It looks like an issue within your environment. If I were you, I would try to narrow the problem down. Remove Vagrant from the equation. Get two servers up and running, stick with predictable network interface device names, don’t change them and keep everything simple until you get Pacemaker working with DRBD. I am sure that I am following all steps but it is very strange. I wonder that how to configure active-active mode. Please let me know that way. I use GFS2 for active/active Pacemaker clusters, please see here. Did you ever receive an answer for these? But i want to use just mariadb duplication instead of galera cluster. Is it possible active-active mode in this post? I tend to keep databases isolated (back-end) and use a separate cluster for Apache (front-end) with front-end proxies on top of it really. Check this post for how to add Apache as a cluster service. Hope this helps. I’ve got two servers running the system from this post without any problems that I know of. I just have one of two questions if you can help, I have two physical servers would I need to setup this STONITH? If one of my servers goes offline and comes back on, how to I re-sync the SQL and re-add this server back in the cluster as if I do a pc status at commandline, it says no in cluster? It doesn’t really matter that much what you use, whether it be physical servers, blades, virtual machines etc. The question really is how do you handle split-brain scenarions? You don’t need STONITH if you have some well-tested and proven mechanism that takes care of it. As for your second question, I don’t know your setup, so cannot advise. 2016-07-05T06:49:21.166141Z 0 [Warning] TIMESTAMP with implicit DEFAULT value is deprecated. Please use –explicit_defaults_for_timestamp server option (see documentation for more details). 2016-07-05T06:49:22.540803Z 0 [Warning] InnoDB: Creating foreign key constraint system tables. 2016-07-05T06:49:22.599347Z 0 [Warning] No existing UUID has been found, so we assume that this is the first time that this server has been started. Generating a new UUID: 9b0bb85c-427c-11e6-b344-0800274eaf5b. 2016-07-05T06:49:22.609981Z 0 [Warning] Gtid table is not ready to be used. Table ‘mysql.gtid_executed’ cannot be opened. 2016-07-05T06:49:22.611483Z 1 [Note] A temporary password is generated for [email protected]: lvwXr+i>_3/! 2016-07-05T06:49:27.861283Z 0 [Warning] TIMESTAMP with implicit DEFAULT value is deprecated. Please use –explicit_defaults_for_timestamp server option (see documentation for more details). This log has no errors. Any pacemaker log entries related to ocf::heartbeat:mysql? why mysql service is stopped ??? Thank you your guide was helping me a lot , i had a lot issues doing this setup with others tuto’s. Your guide was the good one , all works perfect , with MAC/Parallel. Question How this setup is good for prod env?? I had setup heartbeat+drbd+mysql on centos 5.5 in the past and still working in prod very good. but this setup can go to prod env? This particular setup does not have fencing (neither resource level nor node level), therefore I would not use it in production. when doing mysql ha cluster I done replication after making mysql resource it works well when there is failover but checking mysql status (service mysqld status) it shows inactive(dead) on both nodes why……??????? How to create a Mysql resource using pacemaker and corosync on centos7 i am succesfully created two nodes and a resource for virtual ip it works well now i want to create a Mysql resource but not able to create as i mention it stops the mysql service but on the node Mysql resource started i am able to login in mysql on that node but the service is stopped…..????? The article explains how to create what you asked for. If you run into problems, check logs to see what’s failing, and troubleshoot accordingly. Successfully created Postgresql cluster following your guidelines, awesome write-up, thank you very much! Does anyone know what is causing this failure below? It would seem the packages are not compatible with the kernel. I use kernel 3.10.0-327.36.3.el7 with kmod-drbd84-8.4.7. I haven’t upgraded to kmod-drbd84-8.4.8 yet. According to changelog, kmod-drbd84-8.4.8-1_2.el7 requires kernel 3.10.0-514.el7. Therefore upgrade your RHEL kernel to the version specified, wait for CentOS 7.3 to be released, or downgrade to kmod-drbd84-8.4.7. It works without all these errors. I guess its due to a newer version in yum. See my previous reply, it explains your problem. As Tomas has said it’s the kernel version. I’ve just checked and CentOS 7.3 (1611) has kernel 3.10.0-514.el7 in it. You can get it now if you enable the continuous release repository (# yum-config-manager –enable cr), just be aware that the CR repo doesn’t have the same QA testing on the packages as the official release, which I would expect to be released relatively soon. Good to test with in a pre-production environment, not so much in production. Thank you for this, I was at a stand still..
Change the datadir to point to your mountpoint, the rest should remain the same. Please advise when this file create and how can I recreate it? The tokens file is written when you run pcs cluster auth. If I were you, I’d likely destroy the cluster configuration and start over. Also, it says “Temporary failure in name resolution”. Can you resolve pcmk01-cr and pcmk02-cr? When you say resolve what do you mean? do you have any command to give me for checking this resolving? I meant DNS resolution. What do the below commands return? You need to have the bind-utils package installed for the above to work. I suspect it’s a name resolution issue. Do you have Corosync, DRBD and VIP on the same vlan? How’s network configured for 172.17.235.75 and 172.17.235.106? Can you post the output of network-scripts? I already have other setup on centos7 +GNOME that everything their works fine. Now I’m trying to configure exactly the same setup on centos7 minimal. Is the configuration the same then? Also post the versions of DRBD and MariaDB if you have these installed. And network-scripts configuration for the Corosync ring. (it’s the same for both machines). Look I saw in some article in the network suggestion to check telnet between machine using port 2224. You obviously need to fix the network issue. Is there anything listening on a TCP port 2224 on the node1? Check with netstat or ss. How about firewall? Why do you have a gateway defined for the Corosync network interface? I think you placed your LAN, Corosync and DRBD on the same subnet, didn’t you? If each of them has a gateway defined, then you need to configure ARP filtering, implement source-based routing, and even then I’m not sure if it’s going to work. I check your the is someone listenin on a TCP port 2224 on node 1 and it’s seems nothing is listening (I put the out put of ss -ta below), is it o.k?? Firewall & IPtables services are disabled. Nope, it’s not OK, if the service is not listening. I suspect your network configuration is wrong, please check the blog post for how I’ve configured it. It’s seems that now server is listening to port 2224 but still when trying to to do telnet from node 2 ( (‘rvpcmk02’) to rvpcmk01-cr I got connection refused. actually I don’t understand how the port 2224 that opened now on ‘rvpcmk01’ should be also opened for corosync ‘rvpcmk01-cr’ which have different IP. You messed up your network configuration, please see my previous replies. You get a connection refused error because the service listens on a different IP than it should be. I suggest you either stick to one single IP on your LAN and bind everything to it, or use different subnets as per my blog post. How did it happened that the service listen to different IP than it should?? Can I use instead the same IPs for Corosync and LAN? Can it cause a problems if LAN NIC & Corosync NIC will be on the same subnet? I don’t know how did that happen, but heartbeat interfaces should be placed on a non-routable vlan. So I deleted my servers and started from scratch. everything was configured properly until the point I had to start the cluster. I’m getting a message: “Unable to connect to rvpcmk01-cr ([Errno 111] Connection refused)” for node 1 while other node started successfully. below I attached the error. iptables & firewalld are disabled so what can be the reason for this connection refused? Connection might be refused due to incorrect authentication. Eventually I stop & start the cluster once again and nodes started but still so issues like I replay in 08/02/2017 at 3:58 pm. can you please take a look on the last replay from me?? (By the wat how can we solve this case issues with incorrect authentication? O.k so I take snapshot back to the state before start configure the PCS and start again the configuration, I saw my problem start with the authentication process. and saw errors, I also check the tokens files on both nodes and it’s seems that token for node1 on node2 didn’t created. WHAT CAN BE THE REASON FOR THAT? it’s seems that I have problem of connection between nodes. I added the hostname & the IP of both corosync nic to /etc/hosts file on both servers. Here are the logs from the “auth” command and the output of tokens on both nodes. Remove (or rename) /etc/corosync/corosync.conf. Without that pcs cluster auth won’t create the tokens file. Provide an empty config for /var/lib/pcsd/pcs_settings.conf (remove any cluster reference as well as set data version to 0). Then authenticate with pcs cluster auth and create a cluster with pcs cluster setup. unfortunately no, I sent replay to you in the last hour with what I think cause all the problems, I cannot see the message now, maybe you need to aprrove it. 1. I don’t have file /etc/corosync/corosync.conf , I think it’s create only after “pcs cluster setup” and I took snapshot to point before I run it. I have it up and running on CentOS 7.2. I have not tested the configuration on CentOS 7.3. I create my own resource agent for handle my private services. I create resource with the RA I created and it’s works fine. when my resource is failing and I run the command “pcs status” I can see an error message about my failed resource. Now my question is if I can handle the error message that displayed their ?? for example can I put my customize the “unknown error” string or the “exitreason=’none'” ?? Hi Lidor. I’m sorry, but I don’t know. How can I make resource to run only on the Master/Active node? I have oracle resource that I want to be run (and monitor) only on the server that is Active and actually have data. of cource in case of switchover resource should stop running on the active node and start running on the NEW active (master) node. In a failover cluster scenario, a resource runs on the active node only. It does not run on the passive node, so you monitor the node that is active. What about the situation before switchover? when both nodes are running o.k , one is active and the second is passive. I’m getting error message from the resource that start operation failed on the passive node – that what I want to prevent. resource operations (monitor/stop/start) should be execute only on the active node. Yes, when everything is OK, then one node is an active node, and one is a passive node. You only monitor the one that’s active, actually you monitor the VIP as it floats depending on which server the service is running on. If your passive node tries to become an active node while the actual active node is still “active”, then I suspect you have a split-brain situation and need to fence the node. what is drbd_t? is default DRBD process name? where & when it’s defined? what is it “man 8 drbd_selinux”? a command? where I should run it? It’s a man page, section 8, for drbd_selinux. At this point you should have all SELinux man pages installed on your system. How to get VIP IP adrress in vmware workstation or in virtualbox. The VIP address is the one you assign yourself regardless of a virtualisation platform the cluster runs on. I suppose there’s something regarding the user mysql which is not configured or misconfigured (password maybe??) , but i don’t know the file i should change to make it work… can someone give me a hand on this? Does the mysql user have read/write access to /mnt? Is the MariaDB service running? Make sure it’s started. Thought so, no worries. That’s what I’ve learnt over the years – most issues tend to occur when you skip one or another part of the tutorial. Check SELinux context, also check that files and folders inside /var/lib/mysql have proper ownership. i would like to ask if the ” Configure Pacemaker Cluster ” part will be execute also in the slave node ? When you commit changes Pacemaker will start resources on both cluster nodes. You can take a look at /var/log/cluster/corosync.log. Hello Tomas. First of all thanks for all your work on this article ! I’ve follow it and my cluster is setup but I’m unable to automate the down / up of the node. I’m meaning that I need to manually perform the command `pcs cluster start –all` to get the freshly up node running correctly as a cluster node (none of corosync or drbd service get up by default). The only reference to startup service at boot time is the command “systemctl enable pcsd.service”. I may missed a point somewhere but if I’m correct this configuration does not handle node restart ? Hi Alex, yes, you’re right, in my particular case the cluster nodes won’t start by default. I did this intentionally, if a cluster node fails or is restarted, I will need to run “pcs cluster start nodename” to start the cluster on it. While I could enable the services to start at boot, requiring a manual start of cluster services gives me the opportunity to do some investigation of a node failure before returning it to the cluster. I hope that this makes sense to you. If you want your cluster nodes to start automatically, you can enable corosync/pacemaker services. Work like a charm ! Again thank for all the knowledge on this page. Hi Tomas. i do all of the steps without any mistake and no error on pacemaker . If you see different database tables, then it suggests that you have a problem with DRBD. You should start with that to see why it’s not working properly for you. I have a question concerning the datadir option both in /etc/my.cnf and in the pacemaker cluster conf. I don’t understand why you are setting it to /var/lib/mysql. By doing so is the database (tables, datas …) replicated accross both nodes ? I guess it is but it just seems weird to me so I prefer to ask before setting it up. I’m sorry if you have already answered this question before but english isn’t my native and I’m sometimes struggling when I read comments. Okay tomas please ignore my dumb question, I just noticed the filesytem configuration in pacemaker, pointing to /var/lib/mysql. Anyway thx for your work again ! I’m glad that you figured it out, and you’re welcome! Is it possible to configure HA MySQL with shared storage? If so, could you tell me how? It’s possible, you can use GFS and iSCSI. Take a look here. We have four nodes cluster DC (1 Master + 1 Slave) and DR (2 Slave), Now we want to restrict Master role to be available in only DC nodes, So we are planning to block MariaDB cluster resources for DR nodes. Could you please let us know, how we can block master role for particular nodes ? Thank you! Please refer to product documentation for how to implement the configuration that you require.